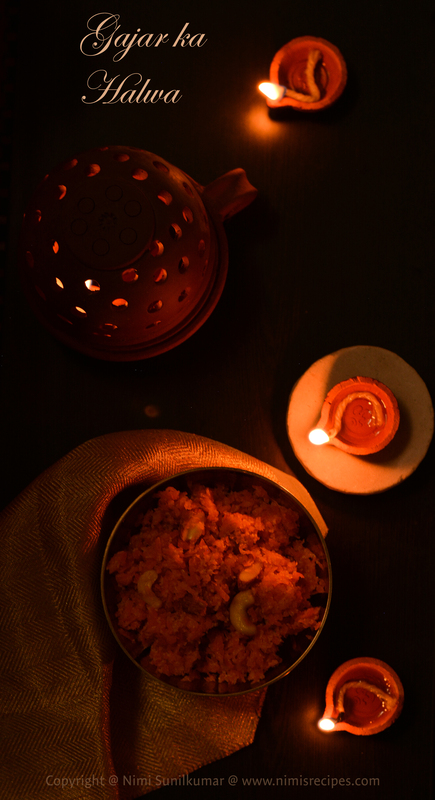 Gajar ka Halwa to pep up the festive spirit! Sweets have always been an integral part of festivities in India. 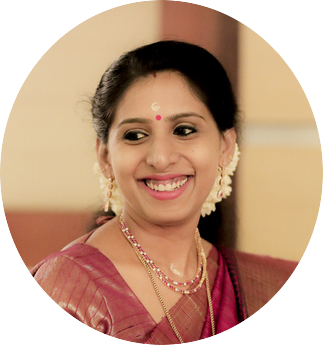 Today being Karthigai Deepam / Thrikarthigai -the festival of lamps which is celebrated in the states of Kerala and Tamilnadu, I thought of sharing a sweet recipe with you all. The lighted lamp is considered an auspicious symbol during this festival. It is believed to ward off evil forces and usher in prosperity and joy. On the day, all the houses, streets and temples are well lit with traditional oil lamps. After the floods, it has taken up quite some time to get things back in order. So here’s starting off my posts on a sweet note! 2-3 cardamoms crushed and skin off. Heat ghee in a pan, fry and separate the almonds, cashews & raisins on to a plate. In the leftover ghee, fry the carrots till it shrinks in size and darkens in color. Pour in the milk, add in the cardamom seeds and sugar. Cover and cook the mix till it thickens. Make sure to keep stirring it so as to avoid it from sticking to the bottom of the pan. Garnish with saffron, almonds, cashews & raisins. 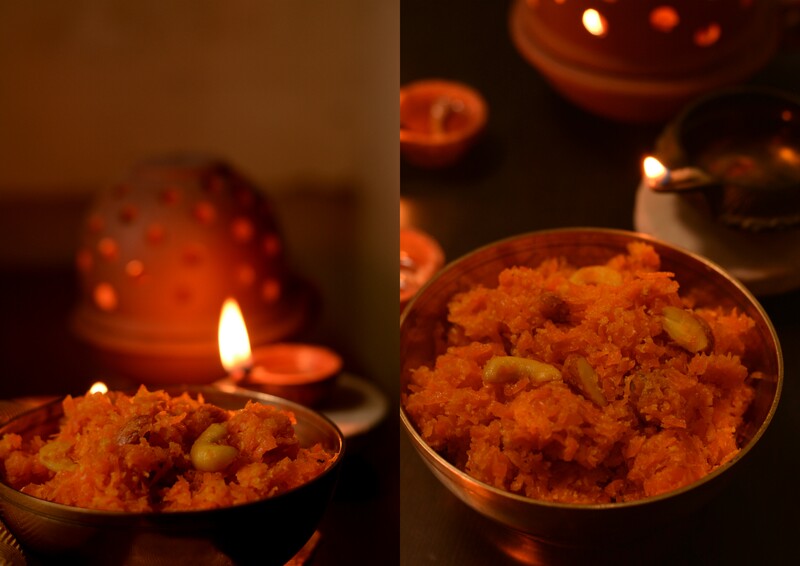 Carrot Halwa is ready to be served! 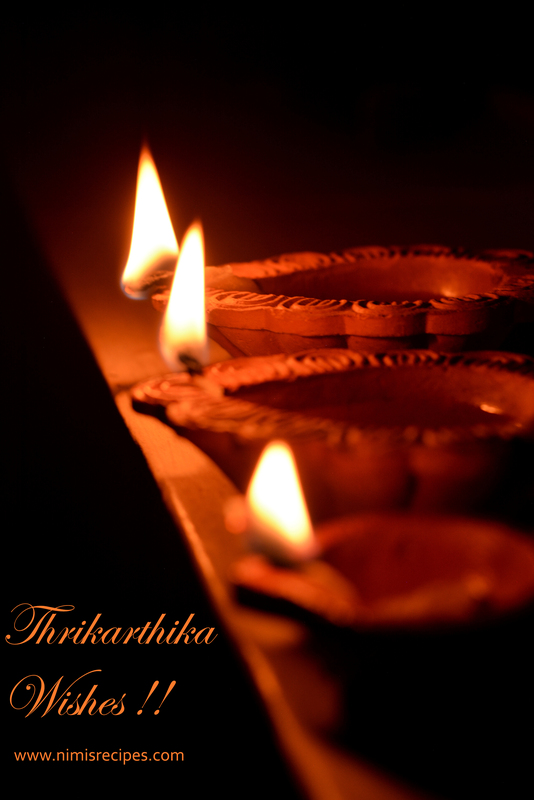 May this festival of lights bring us brightened and enlightened life like that of lamps …Wishing all a Happy Thrikarthika / Karthigai Deepam!!! « Previous post link Mocha Kulfi for Coffee lovers ! !